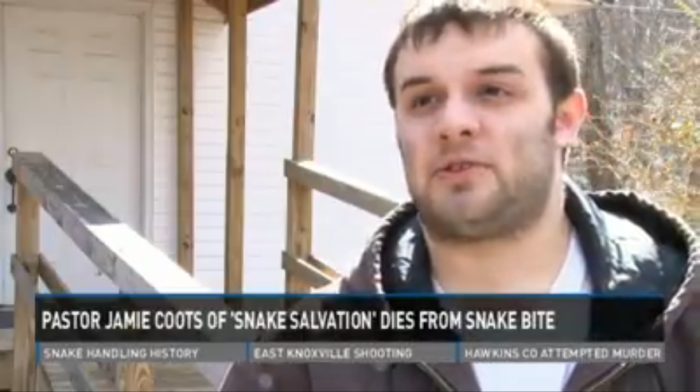 Days after Pastor Jamie Coots of Kentucky's Full Gospel Tabernacle in Jesus Name church died of a snake bite, his 21-year-old son, Cody Coots, says he is taking over and will continue to handle snakes as performed by his father, who appeared in the National Geographic reality show "Snake Salvation." Members of the Middlesboro church wanted to handle snakes even at the funeral of his father, who had refused medical care after the bite, Coots told WBIR. "I knew people were wanting to do church and we couldn't do that in the funeral home because that would be breaking the law," he was quoted as saying. "I didn't want to disrespect the funeral home by saying 'hey, we're wanting to have snakes here'." Some of the members went back to the church after Tuesday's funeral at Creech Funeral Home and handled snakes. A dying wishes of his father was that the church would practice the faith until the end, Coots added. "How many people can pray that that's how they wanted to die, and got exactly what they pray for? Not many?" Coots asked. "His next request was 'when you come to my funeral, pack my snakes, and handle them over my corpse'." Coots remembers his father as someone who wanted his life celebrated with fire, speaking in tongues, and taking up serpents. "He liked things to be styling and profiling. His coffin, they said 'that's a Cadillac coffin,'" he said. "It felt like he was here with us Tuesday night while we were taking up serpents next to him." If he stops handling snakes "I don't know if he would come back out of his grave and slap me clean across the face," Coots added. "That's how much he believed in it. I mean he was that strong in it. He believed in it enough he died for it, so I won't step down for anyone." Coots told TMZ he would also refuse to take medical care if he is bitten by a poisonous snake. "I will lay right there and say to everyone, it's God's will. It's good enough to live by, and good enough to die by." However, Coots said it's too early for him to be a pastor but has no option after his father's death. The adherents of the 100-year-old practice, which is common among a sect of Pentecostal Christians that number about 1,000, believe they are instructed by Jesus Christ in Mark 16:15-18, specifically verses 17 and 18 in the King James Version, to pick up serpents. These churches won't quit handling snakes, Pastor Andrew Hamblin, another snake-handling pastor from Tabernacle Church of God in LaFollette, Tenn., told WBIR. Pastor Coots served as a mentor of sorts for Pastor Hamblin. Hamblin was at the service late last Saturday when a snake bit Coots. "He looked me right in the face, he looked at me and said 'sweet Jesus,'" Hamblin recalled. "He never opened his eyes, he never said another word." Hamblin returned to his own church and handled snakes. "God moved on me and I took up serpents and I preached the 16th chapter of Mark and told them it was still real," he said. Talking about the reality show, Hamblin said, "I had seen serpent handling on TV, but in real life he was the first man I'd actually seen take a serpent up. I handled my first serpent right here at this church straight out of his snake box. He handed my wife her first serpent."